"Dr. Binzel backs up the information found in "World Without Cancer" with actual case histories and results. For those that think that Laetrile is the only component in cancer treatment, this book shows why, and how, cancer needs to be treated - a combination of vitamins, diet and laetrile. 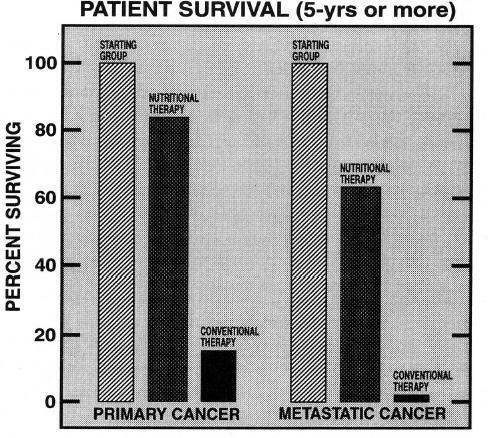 Actual programs used to achieve 82% success rates in treating primary cancer, and 65% in treating metastatic cancer, show you the vast difference between "orthodox" cancer treatment, with success rates of less than 10%, to this "un-approved" treatment. Most definitely something you want to share with your friends." It is essential that a comprehensive approach be taken as per Dr. Binzel's protocol below also emblished, however, the importance of eating raw and incorporating foods containing nitrilosides (B17) as a preventative is a far better approach then reacting after the fact, which is always more difficult especially if one has been subjected to the slash, burn and poison approaches first. I am going to outline, in generalities, the treatment that I use. For any individual reading this book who decides to treat himself with what follows, 1 say, "Please read the paragraph above again, and again and again!" If you think it is bad for a doctor to treat himself, how much worse is it for someone who knows little or nothing about medicine to try to treat himself? God did not make any two of us exactly alike, thus the exact treatment must be fitted to the needs of each patient. 2. To take away from the body those thing that are detrimental to the normal function of its immunological defense mechanisms. 6. Pio-A-Mulsion (25,000 I.U. Vitamin A per drop) - 5 drops daily. The oral Laetrile is given in a dosage of 1 gram (two 500 mg, tablets) daily on the days on which the patients do not receive the intravenous Laetrile. I have them take both tablets at the same time at bedtime on an empty stomach with water. The water is important because there are some enzymes in the fruits and vegetables and in their juices which will destroy part of the potency of the Laetrile tablets while they are in the stomach. Once the stomach has emptied, this is no problem. When I start the intravenous and oral dosages of Laetrile, I also begin to increase the amount of Vitamin C*. I have my patients increase their Vitamin C by one gram every third day until they reach a level of at least six grams. In some patients I use more. I find that there are some patients who develop irritation of the stomach or diarrhea with the larger doses of Vitamin C. I find by increasing this by one gram every third day that, if these symptoms develop, I can reduce the Vitamin C to a level that causes no problem. I find that most of my patients tolerate the higher doses of Vitamin C very well. On the days that my patients receive intravenous Laetrile I ask them not to take their Vitamin A. There have been some studies indicating that Vitamin A may interfere with the body's ability to metabolize intravenous Laetrile. This has not been fully proved, but I choose to have my patients not take their Vitamin A drops on the days on which they receive their intravenous Laetrile, Also, I tell my patients not to take the Laetrile tablets on the days that they receive their intravenous Laetrile. They have received intravenously as much Laetrile as the body can handle for that period of time. There are no ill effects from taking the tablets on those days, but the effect of the tablets is wasted. I do not want to leave the impression that Laetrile is the only source of nitrilosides. As stated in Chapter Two, there are some 1500 foods that contain nitrilosides. These include apricot kernels, peach kernels, grape seeds, black-berries, blueberries, strawberries, bean sprouts, lima beans, and macadamia nuts. The advantage of using Laetrile in the cancer patient is that Laetrile is a concentrated form of nitrilosides. It can raise the nitriloside level in the body (and, thus, re-establish the body's second line of defense against cancer) much more rapidly than can be done by diet alone. This means a diet that is high in salads. Salad dressings are permitted as long as the salad dressings do not contain anything which the patient may not have. Salad dressings which contain egg or sugar are not permitted. I find that many of my patients soon begin to make their own salad dressings. This is fine as long as they start with a pure (unrefined) vegetable oil and use no refined sugar. I do not attempt to severely limit the salt intake of my patients unless they have a medical problem which requires it. I tell them that salt may be used in moderation, but any salt that is used should be sea salt. The mineral content of sea salt is far superior to mineral content of the salt we normally use. Iodized sea salt is fine, if they need it. I encourage them to use a variety of other herbs and spices in order to vary the salad dressings so they are not eating the same thing over and over again. Butter in small amounts is permitted. Any butter that is used should be real butter rather than any margarine. Vegetable oil hardened into a solid is detrimental to good nutrition. I keep my patients on this type of program for at least four months. It is my opinion, in twenty years of work in this field, that it takes that long to get this defense mechanism to function normally. If, at the end of the first four months, the patient is not doing as well as I would like, I continue the strict diet for as long as necessary. At the end of four months, if the patient is doing well, 1 then liberalize the diet. I will then allow the patient to add chicken, turkey and fish to his diet. Ninety percent of the diet at that time consists of the original strict diet plus the chicken, turkey and fish. The other ten percent of the diet may include red meats, cooked vegetables and dairy products. I caution my patients that, within any two-weeks period of time, the red meats, cooked vegetables and dairy products should never exceed more than ten percent of their total diet. * Cancer: "Nutrition and Survival"
My Dad has been diagnosed with lung cancer,and has heard about B17 and its possible effects on the cancer. B17 is apparently not availabe in South Africa and in Holland,where he lives. Where are we most likely to get access to treatment / medication which includes B17? As the previous question, I would like to know how my dad that lives in South Africa can access B17 treatment. He was recently diagnosed with pancreatic cancer.What would be the fastes way to get the oral treatment to him if it is not available localy. MY DAD HAS COLAN CANCER AND THEY SAID IT STARTED TO SPREAD TO THE LIVER WHERE CAN I BUY LAETRILE. I hope this is not too late for Juliet Barnard and Quinton Bok. Laetrile is abundant in South Africa. Fresh fruit seeds, esp. apricots and peaches have very high concentration of Laetrile. If these are out of season, apple, grape and orange/lemon seeds are also rich in Laetrile. I hope that this has found you guys in time.